MONTGOMERY – Sacred Heart’s Jayden Stone and Talladega’s Kobe Simmons were recognized as the Class 2A and Class 4A Boys Players of the Year during the Miss and Mr. Basketball luncheon here today. Pisgah senior guard Annie Hughes and Mountain Brook senior forward Trendon Watford were named Miss and Mr. Basketball, respectively. 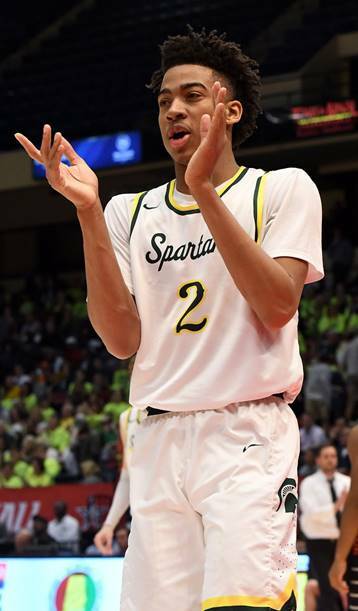 Stone arrived in the Sacred Heart program this summer after the school he was attending in Birmingham shut down basketball and led the Cardinals to their sixth straight trip to the state championship game. The junior was the MVP of the Calhoun County Tournament on a runner-up team and MVP of the Class 2A Northeast Regional. Simmons led the Tigers to their first Class 4A state championship. Hughes, an Auburn signee, was also named the Class 3A Girls’ Player of the Year and recently named the Gatorade Alabama Player of the Year. She led Pisgah to the 2018 and 2019 Class 3A state titles, earning state tourney MVP each year. She averaged 21.4 points, 7.0 rebounds, 4.2 assists and 3.5 steals as a senior. Hughes is the first player from a school in a classification smaller than 5A to win Miss Basketball since Hayden Hamby of 3A West Morgan in 2011. Watford, a 6-foot-9 unsigned senior, also named the Class 7A Boys’ Player of the Year. He was unable to attend the luncheon participating in Wednesday’s McDonald’s All-America Game. He led the Spartans to three straight Class 7A state basketball championships – earning MVP honors all three years. Watford was Mr. Basketball last year, too, beating out a field that included Sacred Heart’s Alabama signee Diante Wood. He is just the fourth repeat winner of the award, joining John Petty of Butler/Mae Jemison (2016-17), Trevor Lacey of Butler (2010-11) and Ronald Steele of John Carroll Catholic (2003-04). Hughes gathered 52 points in the Miss Basketball balloting. Finishing second was Spain Park’s Barker (46), followed by Pleasant Home’s Baldwin (45), Joiya Maddox of Hoover (10) and Hazel Green’s Snodgrass (9). Watford led the Boys’ Super 5 All-State Team with 11 first-place votes and 66 total points. Rounding out the team were Kobe Brown of Lee-Huntsville (27), Demond Robinson of Lee-Montgomery (27), Kam Woods, Pinson Valley (20) and Jaykwon Walton of Carver-Montgomery (19). Anniston sophomore guard Allasha Dudley was a finalist for the girls Class 4A Player of the Year awad.